Choosing replacement windows is a big decision. You’re making a substantial investment that will hopefully bring a number of important benefits: greater energy efficiency, improved comfort, lower utility bills, more convenient operation, improved appearance and increased resale value when you sell your house. In order to enjoy all these benefits, you need to choose the right windows and the right contractor to install them. Dr. Energy Saver has the products and skilled technicians needed for flawless replacement window installation. Contact your local contractor to schedule a home energy audit or estimate for window replacement! Consumer Reports replacement window ratings are available for a limited number of replacement windows. But the most comprehensive testing and rating of replacement windows is done by the NFRC. Unlike Consumer Reports replacement window ratings, NFRC ratings are used not just by homeowners, but also by architects, contractors, building officials and others to compare all kinds of windows. 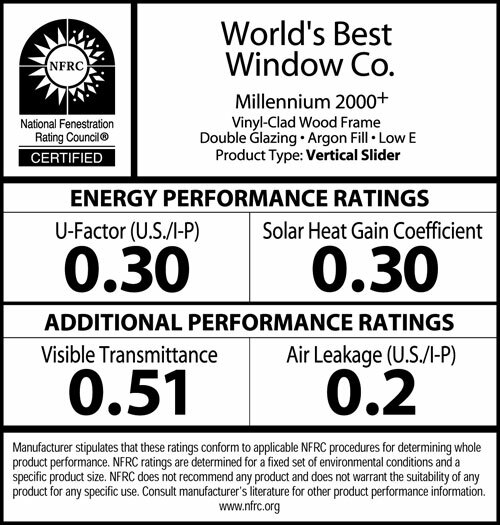 The NFRC label attached to a window contains four basic window performance ratings. U-factor. Use U-factor to assess a window’s wintertime performance. The lower the U-factor, the better the window will be at keeping heat inside your house during cold weather. 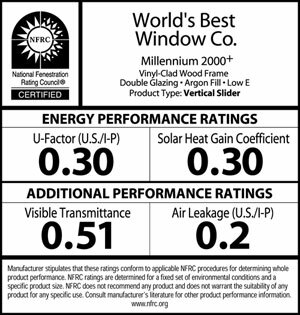 Sunrise Windows have one of the best (lowest) U-factor ratings of all windows, scoring as low as 0.22 for their triple-pane windows. Solar heat gain coefficient. SHGC tells you how well a window can prevent unwanted heat gain during hot, sunny weather. SHGC is expressed as a number between 0 and 1. The lower the number, the better. SHGC is more important in hot climates, because it can help lower cooling costs. Visible transmittance. Expressed as a number between 0 and 1, VT tells you how much visible light can pass through the glass. VT has no direct effect on energy efficiency, so it’s less important than U-factor or SHGC. Air leakage (infiltration). Less leakage = more comfort and energy savings. Ratings typically fall between 0.1 and 0.3. Sunrise Windows outperform many other window brands with leakage rates of .14 (double pane) and 0.04 (triple pane). Window style and size. Make sure that replacement windows are available in all the styles and sizes that are required for your house. For example, you may need picture windows as well as operable windows, and bay or bow window units. Maintenance. Most homeowners prefer the maintenance-free performance that vinyl and aluminum-clad windows provide. Viewing area. As the window frame gets wider, the glass panel gets smaller. Look for a replacement window with a high-quality, low-profile frame that provides maximum viewing area. Insulated glass. For many years the term “insulated glass” referred to the double-pane window configuration that created an insulating airspace between two panes of glass. Filling the enclosed airspace with argon or another special gas enhanced the window’s insulating value. Today, a limited number of companies offer triple-pane windows that have two insulating airspaces instead of one. Triple-pane windows take energy efficiency to exceptional levels. Installation expertise. Who will be installing your windows? Even the best replacement windows can perform badly if they are not properly installed. Dr. Energy Saver technicians are trained to provide expert installation that includes protecting your house from construction-related damage during installation. Dr. Energy Saver also makes sure to insulate around all replacement window frames to ensure maximum energy-saving performance. Window warranty. Some manufacturers warrant the window hardware and glass seal for 10 years, while others offer warranties of 20 years. These warranties may or may not be transferable should the house be sold, and they are sometimes pro-rated, which means that as years go by the warranty value diminishes. Sunrise Windows installed by Dr. Energy Saver have the best warranty available from any window manufacturer: a transferable, lifetime, non-prorated warranty. Still not sure which replacement windows are right for your home? Not a problem - that's why Dr. Energy Saver window replacement experts are here! Your local dealer can talk through all the pros and cons of any option you are considering to help you find the best choice for your home. Find your local dealer today!